Rentex aim to distribute Hyco water heaters at competitive prices, our range of light commercial and domestic vented, unvented, undersink, storage tanks and over sink electric instantaneous hot water heaters are from Hyco manufacturing. Such as; Speedflow, Inline and the Hyco Handyflow oversink point of use vented system. By focusing on a small and popular range of electric water heaters that are designed for locations that require a easy no fuss installation we are able to provide our customers with highly competitive alternatives to some branded names. With small compact units such as the inline instantaneous water heater to the large 90 litre storage water tanks that can provide enough hot water for a small dwelling, we are sure we have a water heater for most applications. As distributors of hyco water heaters Rentex are able to provide these items when purchased from our online store at competitive prices. Our aim with hyco water heaters is to ultimately bring you the broadest range of products from leading water heating manufacturers at very competitive prices. We are a small enough company to be able to assist each customers requirements whilst remaining large enough to maintain a quality service, regardless of size we treat all of our customers with the same caring and attentive service on which we have built our business reputation. Concentrating on a small range of quality water heaters such as the speedflow SF10 and the speedflow SF15 unvented 15 litre electric water heater means we can provide highly competitive prices for water heating products. Our hyco range also extends to the hyco inline instantaneous and handyflow water heaters and associated accessories such as expansion vessel kits and pressure reducing valves, replacement hoses, filters and vented mixer taps. An unvented water heater system heats water directly from the mains water supply; consequently an expansion tank is not usually required depending on the installation. Unvented hyco water heaters offer a number of benefits compared to a conventional vented water heater / point of use electric water heater systems including higher pressure / higher flow rates and balanced hot / cold water supplies. 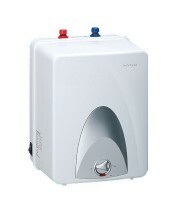 Unvented water heaters are ideal where hot water is required for multiple outlets, such as kitchens & washrooms. Large capacity water heaters are available for more commercial options such as dish washing, hand washing or low demand canteen use. Unvented hyco water heaters are incredibly flexible as they can be sited practically anywhere, hyco water heaters such as the Speedflow are available as under sink water heaters and can also be used as over sink water heaters. Which literally means they can be positioned over the sink or under the sink inside a base unit, depending on your hot water requirements. Hyco vented water heaters like the Handyflow HF05LQ are generally installed directly over the sink area and are commonly referred to as point of use water heaters. Point of use water heaters have an open outlet and rely on the opening of a tap or valve on the inlet side to displace the hot water within the heater with the incoming cold water. The open outlet ensures that any excess pressure in the heater is vented usually via a special vented tap or a spout. Water expansion is accommodated by allowing the water to drip from the spout. Our point of use hyco water heaters are ideal for use with single sink requirements for example in kitchens, surgeries, workshops, cafes and most small washrooms. When installing water heaters it is important to fully utilise the right water heater accessories. As every water heater installation is different, accessory packs are used to ensure that your water heater is installed correctly and safely. In some cases, expansion in a cold water main is restricted via a stop valve, check valve or water meter therefore we at hyco water heaters recommend that an accessory pack including an expansion vessel should be fitted. It is also essential that you are aware of your maximum incoming water pressure prior to installation.